I've been (rightly) making a huge fuss about the first post-Oasis record from Noel Gallagher but let us not forget it was Liam who struck first when Oasis splintered. Beady Eye released the quite respectable Different Gear, Still Speeding earlier this year and while I've not listened to it a ton in the months since its release, there are still a handful of really good tunes from it. 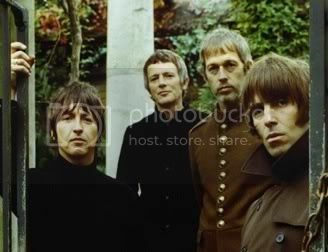 "Four Letter Word" is the first track on the album and sounds like an outtake from Oasis' final studio album Dig Out Your Soul, complete with the psychedelic keyboards, huge slabs of vintage '60s-sounding guitars, and Liam's sneer at full throttle. It's easy to dismiss it as a knockoff of Oasis or the bands Oasis was influenced by but there's another way to look at it. This was the sound the band was going for when Oasis finally imploded and Liam wasted no time getting a record out. This was a sound he was still into, and it's reflected on the record. It's also in keeping with the sonic aesthetics of the band he spent 15 years singing for. This is who he is for better or worse in the case of "Four Letter Word," it's for the better. The video is a good fit for the song, filled with big splashy colors and psychedelic images dissolving in and behind the band doing the best to look detached and cool as they perform the thundering track. It's not exactly a Paul McCartney-John Lennon thing the Gallagher brothers on their own as it's hard to view Liam as an equal partner in the success of Oasis but it's clear both Gallaghers brought important elements to the sound that made them so successful. I have a feeling I'm going to like High Flying Birds more than Different Gear, but I won't regret listening to and owning either disc.